Located in Deer Lodge Montana, this EMD E9 was a locomotive that pulled passenger trains for the once-mighty Milwaukee Road. Bankrupt in 1985 and ultimately absorbed into the Canadian Pacific Railway, the Milwaukee left behind the legacy of a scrappy continental railroad that chose to do things their own way – along with miles of artifacts across the Western landscape. 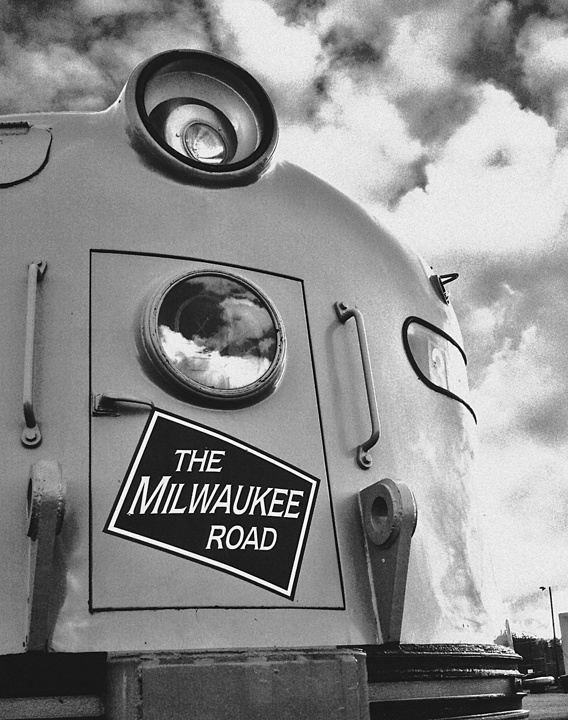 Depending on who you talk with, the demise of the Milwaukee Road was due to bad management or changing times. In 2012 I read a blog post about editing interesting photos that had uninteresting elements (tried to find the article again but no luck). The case in point was a picture that the writer had taken of the Cyclone Roller Coaster on Coney Island; it had an interesting perspective, but because of overall lighting the sky was mostly blown out and had no detail. In the post he talked about how he could edit out the sky and replace it with something with more character, like dramatic clouds. The project got me thinking that in my archives there had to be a few shots that could be edited in the same way. And the E9 shot was the first one I thought of. The reason was this: the original photo was well exposed on the nose of the locomotive, but suffered from a very bright sky behind it. Not surprising, since the photo was taken with my camera phone. In any case it seemed like a good candidate to merge a couple of photos and make a good one. Adding to the fire was a fundraising campaign being conducted by the Cascade Rail Foundation, to bring a historic Milwaukee Road locomotive to their restored railroad depot in South Cle Elum WA. I thought maybe I could create something to donate, so they could sell and benefit from the proceeds. The biggest hurdle I had was trying to get rid of the old sky. Initially I first tried by changing the sky color to one hue and then setting the color to transparency; that didn’t work, mainly because it only made the locomotive transparent while preserving the color I wanted to remoe. I also watched a tutorial video on Youtube, where the person used the equivalent of an eraser to get rid of the stuff he didn’t want. That technique seemed to work for him but didn’t allow me enough control around the edges between the sky and the locomotive. I tried different file types and two different editors. Each tool had a different hurdle to overcome. Help Files for each program – GIMP and Adobe Photoshop Elements 8 – weren’t much help at all. I was either using the wrong verbage to search solutions, or didn’t know what I was doing. But I sure knew what I wanted. Use the GIMP “Fuzzy Selection Tool” to select the entire sky in the train picture. Choose “Color To Alpha” to remove the color from the train picture. After that I converted the photo to black and white using Pixlr-O-Matic, using one of the filters with extra contrast. The resulting image was then saved as a JPEG file at 360 dots per inch (dpi) to allow for larger prints. Sure, if someone looks really close at the outline of the locomotive, a trace can be seen between the train and the sky. I mentioned it to a couple of people; one person said, “I see it, and notice that kind of thing in edited photos, but yours doesn’t bug me.” Phew. In a later revision I went in and softened the line. 16x20s of this improved train picture were ordered and looked great! Removed the discolored sky from photo.